Does sustainability need rational or irrational people? 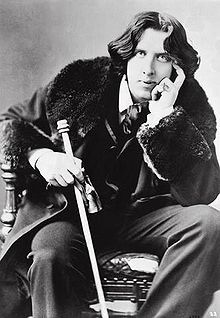 He isn’t quite my name sake but Oscar Wilde once said “the rational man looks at the world as it is and adapts himself to it. The irrational man looks at the world and adapts it to him self. Therefore all change depends on the irrational man.” A good place to start would be teaching irrationality. It got me thinking. The problems and challenges we face in moving to a sustainable future on one planet need us to both adapt ourselves and adapt the world. But I can relate to the statement “all change depends on the irrational man”. The irrational man changes the world and the rational man adapts himself to it, therefore we need the irrational man to change the world first and we need rational man to change himself. We need both but the changes we need will be led by the irrational man – the entrepreneurs. The question is what is an irrational man? My Dad sent me the Oscar Wilde quote after I sent him a link to an article I read about a research study that found that troubled kids maybe well be entrepreneurs in the making. My email to my Dad said – “I wish I had known this as a kid”. The conclusion of the study “male participants who pushed the boundaries and broke the rules as young people — but weren’t regularly involved in criminal activity — were more likely to start their own business.” Hhhmmm sounds very familiar to me. It sounds pretty irrational to me but also with a bit of obstinate thrown in. Obstinate – Stubbornly refusing to change one’s opinion or action, despite attempts to persuade one to do so. Very difficult to change or overcome. I am glad I was irrational and obstinate when I was growing up, it was obviously in part what made me who I am and what I have achieved today. I just wish that teachers and the education system recognised the value of and even taught irrationality and entrepreneurship rather quelling it. But then our education system is founded on conformitism, KPIs, league tables and rational linear thinking. If we need irrational people to change the world then maybe we should start with our education system first. Irrational education. Dad – Happy Father’s Day for Sunday and thanks for tolerating me being obstinate. Reblogged this on ONEPLANET Sustainability Review.